In this article, we’re going to explore the client-side capabilities of Adobe AIR by building a simple, local notes database – think of it as your own personal paste bin. We’ll walk through the process of setting up an AIR development workflow, putting together a basic interface, and then enabling it with many of AIR’s front-end and back-end features. Also, if you’re planning on playing along at home, you’ll want to grab the code archive for this article. I’ve made available the skeleton files from which to start, the completed application, and the final packaged AIR app. We’ll use Aptana Studio to build our application – if you haven’t installed this tool yet, download and install Aptana Studio before reading any further. 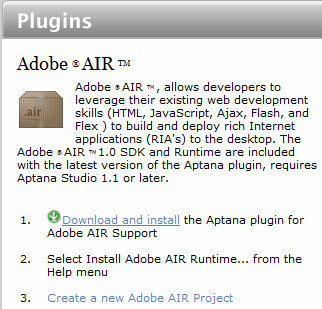 We’ll also install the AIR plugin for Aptana. When you first launch Aptana, you’ll be asked to choose a workspace. Create a new folder to store your AIR projects (it can always be changed later, should you need to). You’ll see the welcome screen when Aptana loads, as displayed below. 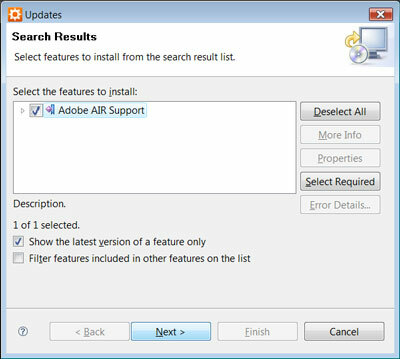 Select Download and install to install the AIR plugin, and select the Adobe AIR Support check box, as I’ve done below. You’ll need to restart Aptana for the plugin to take effect. The AIR Debug Launcher (ADL), which allows us to run AIR applications on-the-fly, and monitor debug output. The AIR Developer Tool (ADT), which provides a set of tools to package applications for distribution. If you’re not sold on using Aptana, feel free to explore these alternatives. The official Adobe AIR documentation contains more details. We’ll use an SQLite database in our sample application, and fortunately AIR comes with a built-in SQLite driver. While we can construct our database on-the-fly, it’s more practical (and more efficient) to distribute a pre-populated database. I recommend using the open source SQLite Database Browser to get up and running quickly (also available as a Firefox extension). It runs on Windows, OS X, and GNU/Linux, and the binary packages work straight out of the box. Grab a copy from the SourceForge download page. If you haven’t used SQLite before, it functions similarly to most relational databases – with a few exceptions; in particular, it applies data types to values (cells), rather than containers (columns) â€“ read more about SQLite and data types on the SQLite web site. We’ll start by creating a template for our user interface, and then we’ll add each of the above features progressively. AIR’s built-in browser uses the WebKit rendering engine, which does a fantastic job of adhering to web standards. I find it practical to build the prototype of my interface in HTML, then test it in Firefox. Doing so means I can rely on the eternally useful Firebug tool to iron out any kinks. 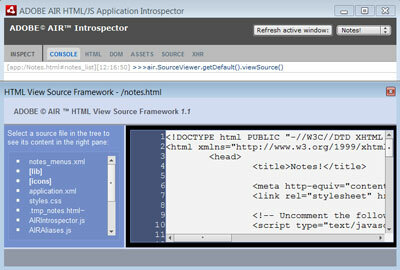 I’ve mocked up a basic interface for our Notes application in HTML, which is shown below. It includes a New note form, which we’ll hide when it’s not needed. For us developers who write lots of code, the ability to store monospaced text notes would be really handy, so we’ll surround our actual note contents with <pre> tags. I’ve prototyped this in Firefox, but I’ve taken the actual screenshot in an AIR window itself. Notice how AIR adds some default chrome to some of the elements (that grey area around the edge) This is optional (see the AIR documentation for more details). We’re also displaying containers with rounded corners in our app; since we know that our app will always run within an AIR window, we don’t have the same cross-browser compatibility woes that we experience on the Web. We can therefore make use of WebKit’s many special CSS properties – in this case, the â€“webkit-border-radius property. The created field refers to when the note was created, and is stored in seconds (in UNIX time, which is the number of seconds that have elapsed since Jan 1, 1970). The data field will be a BLOB (Binary Large Object), so that we can fit in just about anything. We’ll make our id field an INTEGER PRIMARY KEY, our title will be a TEXT, and the created field will be an INTEGER (“NUMERIC” in SQLite Database Browser). The theory behind using SQL databases in AIR applications is beyond the scope of this article, but Adobe provides some good documentation on strategies for working with SQL databases, which is definitely worth a read. Once we’ve got a base interface and a database, we’re ready to start adding actual functionality to our application. If you haven’t done so yet, download, and unzip the code archive containing the skeleton files for this article (air1-notesdb-base.zip). It’s a good start! Let’s make this application a bit more useful. This jQuery snippet waits until the DOM is ready to be manipulated, then hides the note creation form, and binds to the click event of the Cancel link inside that same form. If you need a primer on jQuery, check out the “jQuery 101” section of this article. Using XML, we can define each menu item as a menuitem node. If a node contains children (additional menuitems), then the parent node becomes a submenu. Now when we run our AIR application again, our menus appear in the application’s window (or in the OS X menu bar on a Mac). Press Ctrl+F11 (Cmd-Shift-F11 on the Mac) to run your AIR application using the same configuration as the last time it ran. Now let’s look at storing and manipulating our data. We’re going to look at databases and file system APIs together, as AIR’s implementation of local SQL databases relies heavily on both. SQLite databases are independent files, and instead of being accessed through a database server, they are manipulated directly by the application. In this case, AIR plays the role of database server for us. However, to get started, we first need to tell AIR where to find the database file by specifying a .db file. All of the file system APIs live under the air.File namespace. There are two important predefined paths for our AIR application: the application directory and application storage directory. The application directory is the folder in which the application itself is stored. The application storage directory is a folder created by AIR for this particular application (and this application only) to store data. The application directory is actually read-only, so if we want to edit our database, we’ll need to place the database file in the storage directory. As we’re distributing our skeleton database as part of the application, we’ll need to copy our database template (notes_base.db) to the storage directory on-the-fly. 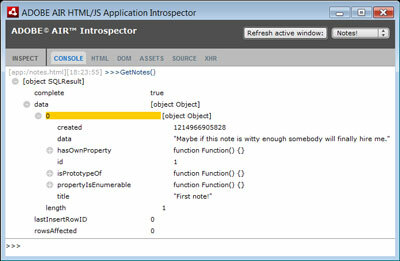 To print to the AIR debug console, or to the console view in Aptana, use the function air.trace(). //In production, uncomment the if block to maintain the database. When using resolvePath to resolve a path on the file system, it’s not necessary to first check whether the file exists – the exists property will indicate whether or not the file can be found. As you can see above, we check this property in the production-ready version of our app. It’s useful in testing mode to revert to our database template each time the application is launched – but we certainly wouldn’t want to replace the database with a blank template when dealing with real data! Place this function at the end of your notes.js file, and while you’re there, add a call to this new method from within our $(document).ready() function (which lives at the top of the file). Now that we’ve set up a database, we’re ready to start pulling existing notes from the database. Just as an SQLConnection object maintains a connection to a database, an SQLStatement maintains a particular query to the database. These SQLStatement instances are linked to a particular connection through their SQLConnection property. SQLStatement objects support prepared statements, and a few different methods for retrieving the result of each query; they can also be reused. Check out the reference page for SQLStatement for further details. Let’s create a GetNotes function to fetch our notes. Here’s the code, which should be added to the end of your notes.js file. This code is reasonably straightforward; we first create a new SQL statement and assign its SQLConnection property to our existing database connection. 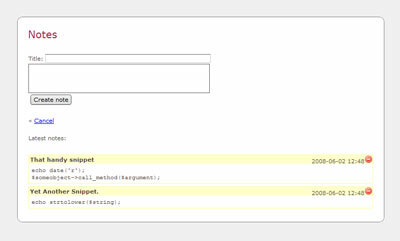 We then set the actual query text and run the query, catching any potential errors along the way. Finally, we return the result as a SQLResult object. This routine inspects each record, checking when the note was created and performing some basic formatting in preparation for displaying the note. We create a new list item for each record, and place each note at the end of the list. We’re achieving all this by relying fairly heavily on jQuery here, but this could well have been achieved using standard DOM calls. OK, so we can display our notes, but we’re still missing some functionality – namely, adding and deleting notes. Let’s enable that pretty, red Delete button! We need to bind a new function to each of the Delete buttons. Note that the actual Delete images will be surrounded by links, each of which has its own unique identifier. We can leverage this fact to determine which note we want to delete. Once we’ve written the code to do this, the code is almost identical to our GetNotes Function. We also need to call ListNotes from our $(document).ready method at the start of our notes.js file. We need to regenerate the list of notes, once we’re done. The first few lines of this code fetch the values from each field. Date.parse (a static date function) will convert a date string into a UNIX time value. When we construct our database query, we add the user data from these form fields. There’s just one minor limitation – we need to escape our string. Failing to do so could potentially result in a malformed query string, hence the escape calls that you see there. In the above code snippet, lines 2â€“4, check whether there is any plaintext data on the clipboard. If there is, we copy that data into the main content area of our New Note form. It would be possible to extend this functionality to include other data formats as well, including rich text and HTML – check out the clipboard data formats in the AIR documentation if you’d like to experiment some more. If we wanted to take this application even further, we could offer a simple “copy” function for each individual note. This functionality is already supported by most major browsers, but AIR goes one step further by allowing us to directly manipulate the contents of the general clipboard. If you’re interested in exploring this functionality, the official AIR documentation does a good job of explaining how to read from and write to the system clipboard, and includes some great code examples. We’ve set the mnemonic on the x of “Exit” – common practice in Windows desktop apps. 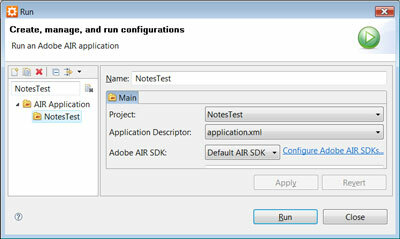 We can close the application by calling the method air.NativeApplication.nativeApplication.exit. However, AIR provides a sophisticated event system designed to deal with more complex operations that applications may need to perform. One of these operations is to prevent default actions. Given that we may want to temporarily disable the capacity of our user to exit the application – for example, during an asynchronous delete-all-notes database operation – we’ll use this approach instead. Place this function at the end of your notes.js file, and your user will no longer be able to terminate the application when it’s in the middle of something important. The AIR docs provide more information about handling application termination. That’s it for our note storage application! If you hit any hurdles along the way, you can download the final project files to compare with your own. To use these files, simply import them into a new AIR project in Aptana (select File > Import > Archive File). Aptana also allows you to easily package the application as an AIR file for deployment. Click the air button on your Aptana toolbar. In the Adobe AIR Package Exporter dialog that appears, just confirm that the right project is selected, and that the application descriptor is called application.xml. To minimize file size, feel free to remove the AIR localizer and the excess jQuery files, then click Finish and an AIR package will be created for you. Here’s what your completed package should look like. If this article has excited you enough to develop more with Adobe AIR, you’re in luck – next week we’ll be publishing a follow-up article, which builds on the principles we learned here.. If you can’t wait, however, be sure to visit the official AIR guide on adobe.com, Developing HTML/AJAX applications on Adobe AIR. This resource contains a number of comprehensive guides covering all the major areas of AIR development, as well as links to other great tutorials. And once you’ve exhausted the documentation, head to the Adobe AIR Developer Center for HTML and Ajax for some terrific, focused tutorials. So what are you waiting for? Get running on AIR!